On thes 3 stock cards above, Hahne & Co. did not use the billboard intended for their logo. 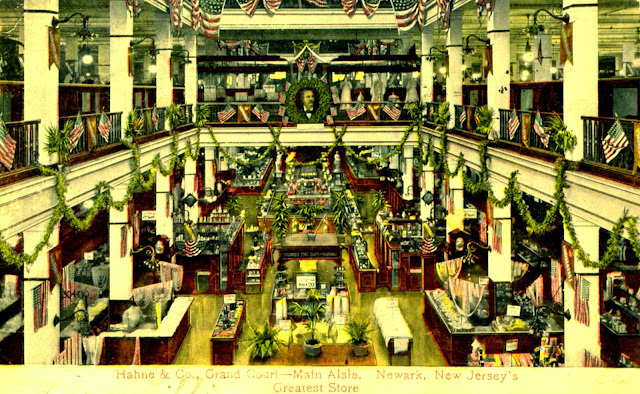 "The firm was founded by Julius Hahne in 1858 as a specialty store which by the early 20th century had grown into a full-line department store. The store's motto was "The Store With The Friendly Spirit", and it became known as the "carriage trade" store in Newark, NJ. 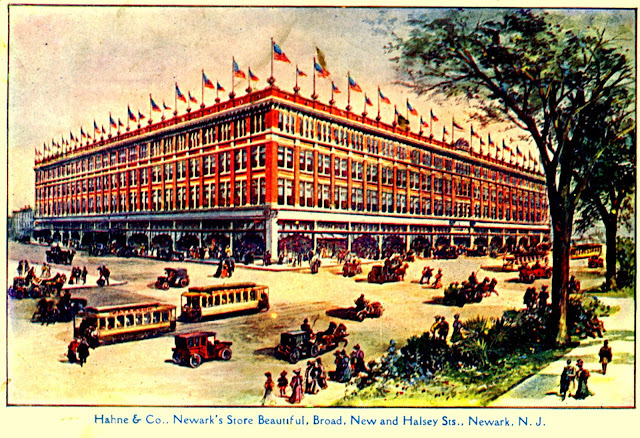 In 1911, a modern flagship store designed by architect Goldwin Starrett was opened at 609 Broad Street in downtown Newark. Occupying a 23-acre (93,000 m2) site, this single building contained 441,000 square feet (41,000 m2) of selling space spread over five floors (basement through 4th floor), with an atrium in the center of the building which ran from the street floor to the 4th floor." Above and below are postcards from the Diver collection. No information in regard to their publisher is provided on the cards. The atrium made the interior a showplace. I'm sure it was a magnet for shoppers and a stimulant for sales, as the world was just beginning to brighten due to the introduction of electric light fixtures. Though additional satellite stores were added in suburban New Jersey, it is generally believed that Hayne was late to the expansion game and relied on urban core shoppers long after those shoppers disappeared. The suburban stores were sold off and are now operated by other companies. 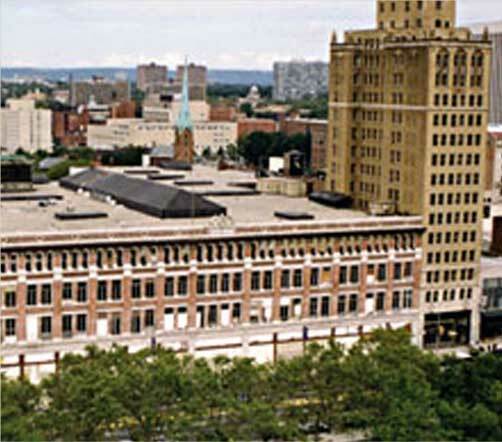 As seen in this 2014 Google Street View, the Newark flagship store is vacant, awaiting conversion to a mix of retail, educational and housing purposes along with the adjacent Griffith Piano Company building (on the right). For further information on Hahne's, The Department Store Museum is recommended. As of July 2013, plans for conversion of the store were moving along.... As of Oct 2014, Rutgers University trustees approved a plan to lease three floors of the building. According to Dan Ivers in NJ.com, ground was broken on renovations to this great landmark in early June 2015. The most recent update I could find was by Joan Verdon in NorthJersey.com (12 July 2015). It includes some interior photos. Please add your comments below if you'd like to share them. All submissions must be free of copyright restrictions (in the public domain). Thanks!